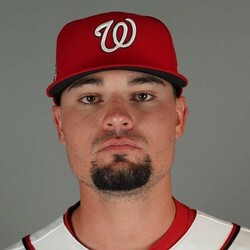 Koda Glover allowed two runs on three hits in the Nationals' 7-5 loss to the Marlins on Saturday. He struck out one, walked one, and fell to 0-2. The Nationals' bullpen woes continue, as Glover allowed the go-ahead runs in a tie ballgame yesterday. A two-run single by Isaac Galloway is what finally did him in, and the Nationals' couldn't rally in the bottom of the tenth. With Kelvin Herrera expected to return this week Glover's tenure at closer should thankfully be short-lived.